"They are looking for the graves of murdered women, and they are led by the killer himself." Cable TV channels across the dial are filled with so-called "reality" television, yet not along the lines of the Survivors and Big Brothers of the world. There are numerous programs these days that deal with real-life accounts of murder, crime investigation, trials, etc. Once such program airs on the A&E channel, and it is called Cold Case Files. Obviously trying to ride the success of the fictional network TV shows CSI and, fittingly, Cold Case, Cold Case Files investigates the mysterious deaths of numerous people, and attempts to solve the mystery by looking at all of the evidence that was left behind by the murderer or assailant. The realistic nature of this material is very intriguing, but with the network shows, it's usually style over substance. The heavy emphasis on substance in Cold Case Files is definitely a welcome departure from the network fluff, plus the realism here always seems to have a larger emotional impact on viewers. Cold Case Files: The Most Infamous Cases compiles 10 of the most mysterious episodes from the series, complete with one of the real charms of it, the narration by the incomparable Bill Kurtis. Kurtis is the kind of campy narration, and he's in top form here. Sure, the campiness isn't intentional and, with a lesser show, could take away the spooky seriousness of the material, but Kurtis is such a pro, that his work is impossible to hate. Not all of the episodes in this set are the same length, with four out of the 10 clocking in at 45 minutes and the rest a much shorter 26 minutes. Much more investigative work has gone into the longer episodes, and the result are tighter, more complete viewing experiences, leaving viewers with a much more satisfied, "mystery solved" feeling than they're bound to have with the shorter tales. One Night on the Bayou: In 1994 investigators were led to a murder victim in the Louisiana swamps. With little to go on aside from the fact that the victim was a convicted child molester, the case stayed on the shelf for years until a thief looking for a pass out of jail tells police the story of the night of the murder. Killer in the County: A decade after three women were killed, police in Wichita Falls, TX created a task force to find out if the murders were connected. The next step is the hunt for a suspect, and when they find a solid one, he is living a clean life as the member of a church choir. Frozen in Time: Denise Huber disappeared in June of 1991 after pulling over to fix a flat tire. Three years later, police find Denise's remains in a freezer inside of a rental truck in Arizona. A Map to Murder: In 2001, six prostitutes are found strangled in Illinois and Missouri, and as detectives are investigating the murders, they soon recognize a pattern and are on the hunt for a serial killer. The Zodiac Killer: This legendary case was opened in 1968, when the random killings had taken place and the killer sent a letter to the media claiming responsibility for 37 murders. 30 years later, a new batch of investigators closely analyzes the case, looking for new evidence as to what really happened. The Green River Killer: The murder of 16-year-old Wendy Lee Coffield in 1982 turned out to be only the beginning of a string of murders near Washington State's Green River. By the end of the decade, there were over 40 victims, with the crimes still unsolved. In 2001, Sheriff Dave Reichert delved into the investigation once again, this time using forensic DNA to try and find a solution. Weepy-Voiced Killer: Karen Potack is left severely injured and mentally handicapped after police find her following a New Year's Party in 1981. The person who reported her injuries was crying on the phone to police when he called, and, when similar events occur, with the same "weepy" man calling to report the crimes, a pattern is soon realized. The Lady Killer: On May 14, 1977, Ruth Masters went for a bike ride and disappeared. Her body was discovered mutilated, but the murder was never solved. In the mid-1990s, the case was reopened with new evidence leading the way. Kidnapped: A family receives a ransom note after their 8-year-old son is kidnapped back in 1991. When the family agrees to the demands, the kidnapper doesn't show up for the exchange, and years go by with the boy remaining missing. Years later, investigators get a break in the case when a series of bank robberies point to a potential suspect. Love Triangle: In 1998, David Stevens is found dead in his burning car, but when police search his apartment, they find clues that lead them to believe that an ex-lover could be behind David's death. Image Transfer Review: The look of these full frame transfers is virtually identical to the way the show looks on TV, which suits this material just fine. Colors and shadow levels are very natural, and sharpness is at an appropriate level. There's a bit of grain and dirt, but nothing that's an issue. Audio Transfer Review: The soundtrack is in Dolby Digital 2.0 and is nothing special, but there's enough surround usage to create the mood that the creepy music intends to set. Dialogue is never a problem, with Bill Kurtis' narration always coming across distinctly. Extras Review: There aren't any extras at all on either of the two discs in this set. 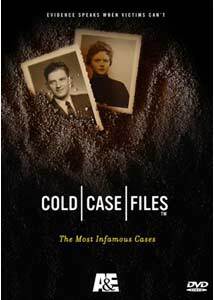 It's great to have some of the best entries from the series included in Cold Case Files: The Most Infamous Cases, but the complete lack of extra features is a major disappointment. There's still many episodes of the series to see the light of day on DVD, so hopefully future sets will include at least a few extras.